Robert Bartleh Cummings was born on 12 January 1965, in Haverhill, Massachusetts USA, and as Rob Zombie is probably best known as a founder of the band named ‘White Zombie’, but aside from music is also a film director and producer, music producer, and a programmer. So just how rich is Rob Zombie? Authoritative sources have estimated that the overall amount of Rob’s net worth is more than $40 million, as of mid-2016, Rob having earned his wealth from all of the facets of his life in the entertainment industry mentioned above. Rob was educated at Haverhill High School, but had an interesting childhood as his parents worked in a circus. After matriculation, Rob moved to New York City, and attended the Parsons School of Design, and became a production assistant for the children’s TV program “Pee-Wee’s Playhouse”; from childhood Rob was hooked on horror films and zombies, and influenced by the works of Stan Lee, Bela Lugosi, Steven Spielberg and Alice Cooper. However, Rob met girlfriend Sean Yseult at this time, and they founded White Zombie – hence Rob’s stage name – and the band added much to his net worth as a leader, and which was active from 1985 until 1998. The band played alternative metal, groove metal, industrial metal and heavy metal music, and released 1 singles, four studio albums, six EPs, two compilation albums, four video albums, nine music videos and nine soundtracks. The most successful were the last two studio albums entitled “La Sexorcisto: Devil Music, Vol.1″(1992) and “Astro-Creep:2000 – Song of Love, Destruction and Other Synthetic Delusions of the Electric Hea” (1995), which were both twice certified in the U. 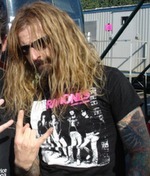 The band was nominated for a Grammy Award, and Rob Zombie was subsequently inducted into VH1’s 100 Greatest Artists of Hard Rock. Rob has also increased to his net worth as a solo artist, from 1998 to the present, working under the labels Roadrunner, Geffen and Loud & Proud. He has released nine singles, five studio albums, a live album, two compilation albums and 33 soundtracks. His first album “Hellbilly Deluxe” (1998) was certified three times platinum, the second album “The Sinister Urge” (2001) was certified platinum and the third album “Educated Horses” (2006) was certified gold in the US. Since 2003, Zombie has also added to his net worth as a film director, producer, writer and actor. He debuted as a director and writer with the horror film “House of 1000 Corpses” (2003). Later, as a director, producer and writer he created the films “The Devil’s Rejects” (2005), “Halloween” (2007), and “Grindhouse” (2007) co-directed, produced and written with Quentin Tarantino and Robert Rodriguez. Then followed “The Haunted World of El Superbeasto” (2009), “The Lords of Salem” (2012), “The Zombie Horror Picture Show” (2014) and “31” (2015). Rob Zombie has increased his net worth as a composer, too, having composed music for all of his films, plus for the video game ‘Twisted Metal III’ (1998), ‘Gran Turismo 2’ (1999) and many others. To date, Rob has made over a dozen appearances in productions as an actor, and has directed about the same number. As his multi-faceted career continues, there is no reason the think that his net worth wont continue to increase. In his personal life, Rob Zombie broke-up with Sean Yseult after seven years, and has been married to Sheri Moon since 2002.